Evolution — fact or fancy? Natural selection — unsupported hypothesis or confirmed mechanism of evolutionary changes? The debate about evolution has all too often pitted religious fundamentalists against scientists, the Bible against empirical observation, without a careful examination of the merits of the scientific arguments themselves. Phillip Johnson, a Berkeley law professor specializing in the logic of arguments, subjects the scientific support for Darwinism to careful scrutiny. Viewed strictly from the point of view of logic and the accepted canons of scientific research, the theory, Johnson contends, is severely lacking in confirmatory evidence. He asks if scientists have put the cart before the horse, prematurely accepting Darwin’s theory as fact and then scrambling to find evidence for it. In the process Darwinism itself has become a kind of faith, a pseudoscience held by its devotees in spite of, rather than because of, the evidence. 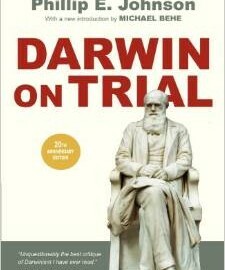 Darwin on Trial is a cogent and stunning tour de force that not only rattles the cages of conventional wisdom, but that could provide the basis for a fundamental change in the way people regard themselves, their origins, and their fate. In 1981 the state legislature of Louisiana passed a law requiring that if “evolution-science” is taught in the public schools, the schools must also provide balanced treatment for something called “creation-science.” The statute was a direct challenge to the scientific orthodoxy of today, which is that all living things evolved by a gradual, natural process—from nonliving matter to simple microorganisms, leading eventually to man. Evolution is taught in the public schools (and presented in the media) not as a theory but as a fact, the “fact of evolution.” There are nonetheless many dissidents, some with advanced scientific degrees, who deny that evolution is a fact and who insist that an intelligent Creator caused all living things to come into being in furtherance of a purpose. The conflict requires careful explanation, because the terms are confusing. The concept of creation in itself does not imply opposition to evolution, if evolution means only a gradual process by which one kind of living creature changes into something different. A Creator might well have employed such a gradual process as a means of creation. “Evolution” contradicts “creation” only when it is explicitly or tacitly defined as fully naturalistic evolution—meaning evolution that is not directed by any purposeful intelligence. Similarly, “creation” contradicts evolution only when it means sudden creation, rather than creation by progressive development. For example, the term”creation-science,” as used in the Louisiana law, is commonly understood to refer to a movement of Christian fundamentalists based upon an extremely literal interpretation of the Bible. Creation-scientists do not merely insist that life was created; they insist that the job was completed in six days no more than ten thousand years ago, and that all evolution since that time has involved trivial modifications rather than basic changes. Because creation-science has been the subject of so much controversy and media attention, many people assume that anyone who advocates “creation” endorses the “young earth” position and attributes the existence of fossils to Noah’s flood. Clearing up that confusion is one of the purposes of this book. The Louisiana statute and comparable laws in other states grew out of the long-standing efforts of Christian fundamentalists to reassert the scientific vitality of the Biblical narrative of creation against its Darwinist rival. The great landmark in this Bible-science conflict was the famous Scopes case, the “monkey trial” of the 1920s, which most Americans know in the legendary version portrayed in the play and movie Inherit the Wind. The legend tells of religious fanatics who invade a school classroom to persecute an inoffensive science teacher, and of a heroic defense lawyer who symbolizes reason itself in its endless battle against superstition. As with many legendary incidents the historical record is more complex. The Tennessee legislature had passed as a symbolic measure a statute prohibiting the teaching of evolution, which the governor signed only with the explicit understanding that the ban would not be enforced. Opponents of the law (and some people who just wanted to put Dayton, Tennessee, on the map) engineered a test case. A former substitute teacher named Scopes, who wasn’t sure whether he had ever actually taught evolution, volunteered to be the defendant. The case became a media circus because of the colorful attorneys involved. William Jennings Bryan, three-time Democratic presidential candidate and secretary of state under President Woodrow Wilson, led the prosecution. Bryan was a Bible believer but not an uncompromising literalist, in that he thought that the “days” of Genesis referred not to 24-hour periods but to historical ages of indefinite duration. He opposed Darwinism largely because he thought that its acceptance had encouraged the ethic of ruthless competition that underlay such evils as German militarism and robber baron capitalism. that his client had violated the statute and invited the jury to convict. The trial thus ended in a conviction and a nominal fine of $100. On appeal, the Tennessee supreme court threw out the fine on a technicality but held the statute constitutional. From a legal standpoint the outcome was inconclusive, but as presented to the world by the sarcastic journalist H. L. Mencken, and later by Broadway and Hollywood, the “monkey trial” was a public relations triumph for Darwinism. The scientific establishment was not exactly covering itself with glory at the time, however. Although he did not appear at the trial, the principal spokesman for evolution during the 1920s was Henry Fairfield Osborn, Director of the American Museum of Natural History. Osborn relied heavily upon the notorious Piltdown Man fossil, now known to be a fraud, and he was delighted to confirm the discovery of a supposedly pre-human fossil tooth by the paleontologist Harold Cooke in Bryan’s home state of Nebraska. Thereafter Osborn prominently featured “Nebraska Man” (scientific designation: Hesperopithecus haroldcookii) in his antifundamentalist newspaper articles and radio broadcasts, until the tooth was discovered to be from a peccary, a kind of pig. If Osborn had been cross-examined by a lawyer as clever as Clarence Darrow, and satirized by a columnist as ruthless as H. L. Mencken, he would have looked as silly as Bryan. The anti-evolution statutes of the 1920s were not enforced, but textbook publishers tended to say as little as possible about evolution to avoid controversy. The Supreme Court eventually held the statutes unconstitutional in 1968, but by then the fundamentalists had changed their objective. Creation research institutes were founded, and books began to appear which attacked the orthodox interpretation of the scientific evidence and argued that the geological and fossil record could be harmonized with the Biblical account. None of this literature was taken seriously by the scientific establishment or the mass media, but the creation-scientists themselves became increasingly confident that they had a scientific case to make. Both Justice Brennan and Justice Scalia were in a sense right. The Constitution excludes religious advocacy from public school classrooms, and to say that a supernatural being created mankind is certainly to advocate a religious position. On the other hand, the Louisiana legislature had acted on the premise that legitimate scientific objections to “evolution” were being suppressed. Some might doubt that such objections exist, but the Supreme Court could not overrule the legislature’s judgment on a disputed scientific question, especially considering that the state had been given no opportunity to show what balanced treatment would mean in practice. In addition, the creation-scientists were arguing that the teaching of evolution itself had a religious objective, namely to discredit the idea that a supernatural being created mankind. Taking all this into account, Justice Scalia thought that the Constitution permitted the legislature to give people offended by the allegedly dogmatic teaching of evolution a fair opportunity to reply. fact, then whatever those doctrines exclude cannot be true. By the use of labels, objections to naturalistic evolution can be dismissed without a fair hearing. impossible—the Academy described their efforts as aimed primarily at discrediting evolutionary theory. “Creation-science” is thus manifestly a device designed to dilute the persuasiveness of the theory of evolution. The dualistic mode of analysis and the negative argumentation employed to accomplish this dilution is, moreover, antithetical to the scientific method. The Academy thus defined “science” in such a way that advocates of supernatural creation may neither argue for their own position nor dispute the claims of the scientific establishment. That may be one way to win an argument, but it is not satisfying to anyone who thinks it possible that God really did have something to do with creating mankind, or that some of the claims that scientists make under the heading of “evolution” may be false. Patterson suggested that both evolution and creation are forms of pseudo-knowledge, concepts which seem to imply information but do not. One point of comparison was particularly striking. A common objection to creationism in pre-Darwinian times was that no one could say anything about the mechanism of creation. Creationists simply pointed to the “fact” of creation and conceded ignorance of the means. But now, according to Patterson, Darwin’s theory of natural selection is under fire and scientists are no longer sure of its general validity. Evolutionists increasingly talk like creationists in that they point to a fact but cannot provide an explanation of the means.